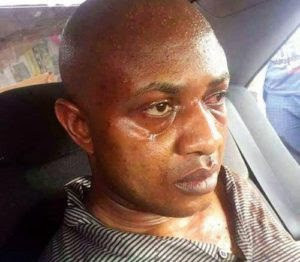 The Wife of Billionaire kidnapper, Chukwudubem Onwuamadike, aka Evans, Uchenna, has appealed to Nigerians to forgive her husband and her family for all the atrocities he committed. In an interview with Vanguard, Uchenna said she was not aware that he was into crime. She said thought he was into haulage, buying engine and spare parts for trucks and imports exhaust pipes. She has asked that all his properties be sold and the money returned to all his victims. "My name is Uchenna Precious Onwuamadike, the wife of the Chikwudubem Onwuamadike who you call Evans. I am 31 years old. I got married to Evans at the age of 17 at Oraifite, Anambra state in 2004. He met me while I was coming back from lesson as a student of All Saints Secondary School, Oraifite and I was in class 6 going to take my West African Examination. We went back to Ghana on the 6th of this month and he promised to join us in no distant time. On the 9th, I called him to know when he would be coming and even the youngest of our children was crying, begging him to come as soon as possible and he promised to come. In the afternoon, I called but he was not picking. I called again, there was noise in the background and the line was switched off. I then called the driver that took us to the motor pack when we were going to Ghana and he told me that there was a problem, that police came and arrested Oga and that they came with a fair complexioned lady. When I heard all the allegations against him, I called his brother in Ghana, his mother, father and other relations but I could not get them. I then called their last born, a student at Oko Polytechnic but he said he had not spoken with him for long. I was confused until I opened Niger news and Vanguard Websites. That was how I got the shocking news about my husband. I collapsed and later called my kids to inform them what I just read about their father. I am ready to come back to Nigeria and plead on his behalf. What I am reading in the news is shocking. Though, I have not heard that he killed anybody but all those he injured or took their money should please forgive him because me and my children. They should kindly forgive him, he will repent. God knows I will not be alive and see my husband doing bad thing and keep quiet. All his wealth should be sold off and given to his victims"
0 Response to "Kidnapper, Evan's wife, Uchenna begs Nigerians to Forgive her husband"